You can use computer audio and video with your computer's built-in devices, or a headset and camera. Lync calls you at a number you provide. Select this if you prefer to call in to the meeting audio with a phone. Use the conference numbers and ID in the invitation to dial in. You're the leader (Organizer) of the meeting, and calling from a phone that isn't connected to your account; such as a cell phone. You're an attendee, but the meeting is secured and you need to be identified before joining, (referred to as Authenticated caller). To control meeting access, select an option under These people don't have to wait in the lobby. To choose presenters, select an option under Who's a presenter? 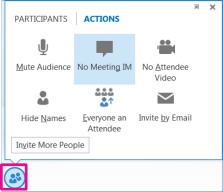 Lync recording captures audio, video, instant messaging (IM), application sharing, PowerPoint presentations, and whiteboard. Click More options in the meeting, and then click Start Recording. Use the controls at the bottom of the meeting room to pause, resume, or stop the recording. After the recording is stopped, Lync automatically saves it in a format that plays in Windows Media Player and Zune. More Options menu, and highlight the recording to play, rename or delete. You can also click Browse to go to the location the recording and make a copy of the file to post on a shared location for others to view. Under the Participants tab, right-click a person's name and use the options to mute, unmute, remove, etc. No Attendees Video to block attendees from starting their video. During a Lync Meeting, you can share your desktop, or a specific program. Pause on the presentation (monitor) icon. Click Desktop to show the entire content of your desktop. Click Give Control on the sharing toolbar at the top of the screen to share control of your sharing session with another participant. You can take control back at any time by clicking Give Control, and then Take back control. When you have finished presenting, click Stop Presenting on the toolbar. 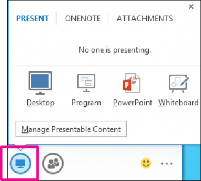 On the Present tab, click PowerPoint, and upload the file in the meeting. or use the arrows at the bottom of the meeting room. Click the Annotations button on the upper-right side of the slide to open the toolbar, and then use highlights, stamps, laser pointer, and so on.